Michael Ian Black: It's OK to be sad, and it's OK to let other people be sad, too. Even a boy. Even your child. Michael Ian Black It's OK to be sad, and it's OK to let other people be sad, too. Even a boy. Even your child. As a culture, we need to expand our vocabulary of emotional communication and emotional intelligence. A component to being a person is that sometimes we feel sad. But there's a societal discomfort with sadness and with any kind of pain — and that's understandable. Nobody wants to experience pain themselves so, if somebody else is experiencing pain in whatever form, it's natural to want to relieve that discomfort, both for them and because we're often not comfortable around somebody else's pain. So, I wanted to write a book — which became "I'm Sad" — about how we don't need to make everything okay for other people. Things are sometimes sad, or sometimes people feel certain ways, and it's not our jobs to change that. What's often most helpful to people who are dealing with sadness is for the rest of us to support them and to let them know that it's okay to be sad without trying to change them. A lot of times, parents try to alleviate their children's sadness or suffering and (obviously) that can be okay. If a person is doing something to your child that's causing them immediate pain, then, yeah, you try to figure out what is happening and help them. But other times, emotions just come into play for reasons — major or minor — and we parents just can't "solve" our children's emotions, even the negative ones. And having a kid who is sad is not even necessarily a problem to solve. The book goes out of its way acknowledge that people feel sad and that one appropriate way to deal with it is to simply bear witness to their sadness. In just sitting with someone else's pain, I think it often alleviates some of their suffering. But I don't think you can just "shake" somebody out of their sadness; it's okay to just be there in support but not try to make it better. There is also gender component to expressing sadness, because boys learn to be reluctant to express emotions that may make them seem vulnerable, whereas women and girls probably have an easier time expressing their vulnerabilities. I don't think you can just "shake" somebody out of their sadness; it's okay to just be there in support but not try to make it better. With boys — and it's gets worse as boys turn into men — so much of our identities (that we are taught consciously and unconsciously) are rooted in strength and the perception of strength. So, when we feel less strong, I think a lot of boys and men feel like, to a certain extent, those feelings rob us of what it means to be a man. It's a very powerful and terrible idea, that vulnerability (which we all experience as humans) makes us less masculine. And when there is no appropriate outlet for that vulnerability — which I think a lot of men feel there is not — it can transform itself into one of the only societally appropriate responses for men: Anger and rage. Those are seen as kind of masculine emotions, which is why girls and women are sometimes shamed for expressing them (though anger can be helpful in certain circumstances). But when anger is your only emotional outlet, you lose the capacity to fully communicate emotionally, and you lose your emotional intelligence. Ultimately, that can mean that you can't even understand your own emotions. When anger is your only emotional outlet, you lose the capacity to fully communicate emotionally, and you lose your emotional intelligence. It's a multifaceted problem, to be sure, but it boils down to something really simple: Masculinity and being a man or a boy is no more and not less than being a full human being, which entails sadness and grief sometimes. We need to be okay, as men and boys, with experiencing those emotions and not feeling like we are less than just for having them at all. Ultimately I would love it if we as a culture expanded our vocabulary of emotional communication and emotional intelligence. I know that a children's book isn't going to do much, but I think it can do a little — and all I'm trying to do is a little, and to keep doing a little bit at a time in all the things that I do. 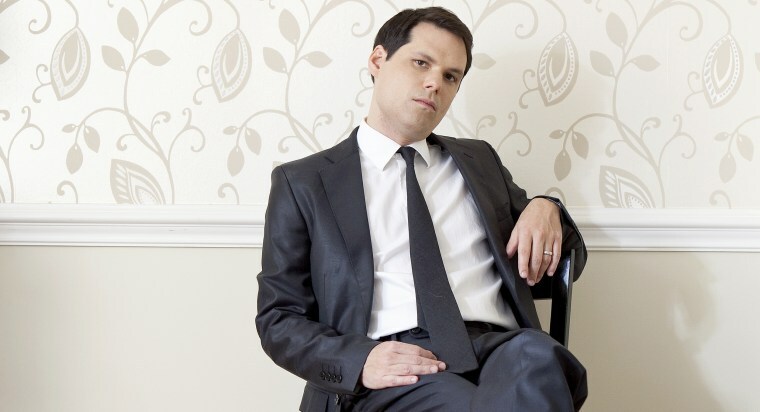 Michael Ian Black is a writer, comedian and actor who currently appears on "Another Period," "The Jim Gaffigan Show" and "Wet Hot American Summer: First Day of Camp." Michael regularly tours the country as a stand-up comedian and is the bestselling author of the book "My Custom Van (and 50 Other Mind-Blowing Essays That Will Blow Your Mind All Over Your Face)." "I’m Sad" is his latest children’s book.